Invite Kathy Vincent, The Scripture Lady, to encourage and train your teachers through one or more of her teacher training workshops. One of the Scripture Lady’s major goals is to provide effective training for the lay Christian teacher who ministers to special needs students. Without a doubt, we believe that you can make a profound difference in the lives that are a part of your special needs ministry. But the need for training is a crucial part of your success. We do not believe that credentialed, highly experienced teachers must direct your special needs ministry. Instead, we believe that the success of your ministry to special needs students will be due to God’s amazing power and work and His use of teachers and helpers who have a heart and willingness to serve this precious group of people. Working with children and adults with special needs can and will be a huge blessing. But it will also present some challenges. For example, you might have to deal with various behaviors that might not be common to you or your workers. Learning how to lovingly approach your students and even their families can make a big difference in how your friends with special needs learn and adjust to your classroom. But taking the time to be trained and receiving effective tools to engage your students will bring great joy to all who are involved in your special needs ministry. How do we effectively reach a group of special needs students who are very diverse in their range of abilities? How do we effectively share God’s Word to individuals with a gap between their chronological age and emotional age? How do we manage various behaviors in our special needs classroom? 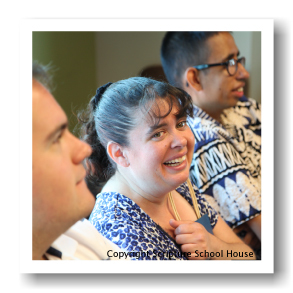 Can we have a time of worship with our special needs students? What kind of music works best? How do we lead Bible games for our friends with special needs? Can we lead a special needs student to the Lord? You and your special needs ministry members can have answers to these questions. Taking a “Scripture Lady Special Needs Ministry Workshop” will educate, enlighten and inspire you to do your best for the children and adults with special needs whom God has sent you. This workshop could also be called “Special Needs Ministry 101”. During this presentation you will learn the foundational basics you need to start and successfully run a special needs ministry in your local church. Much of the information for this topic derives from our friendship and mentorship with one of the leading directors of disabilities ministries in Southern California, Connie Hutchinson. Connie has directed a very successful special needs ministry at EV Free Church of Fullerton, CA for over 20 years. She is also the mother of a daughter with Down syndrome and comes with a wealth of knowledge and experience. Presenting a Bible lesson to your special needs students should be one of the highlights of your week. This can be true for you and your whole special needs ministry staff if you follow our proven template for a successful Bible lesson. Let Kathy Vincent show you how she effectively leads her friends with special needs in a creative and engaging format of Bible study. Kathy leads special needs Bible studies at two different churches and knows what it takes keep the interest of her special needs students. At Scripture Schoolhouse we are proud to be able to present a workshop that showcases the knowledge and talent of Kathy Vincent, also know as “The Scripture Lady.” Kathy has been sharing her Bible verse songs to churches and schools for over 16 years through musical Bible presentations. Her toe-tapping tunes are especially loved by her friends with special needs. They love to follow along with her fun and easy moves. 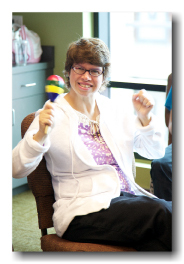 Kathy will show you some basic techniques for having a fun and meaningful time of worship in your special needs ministry. Along with writing over a hundred Bible verse songs, our very own Kathy Vincent has written over 300 Bible review games for both the preschool and elementary ages. Now we have access to many of her adaptations of these games that work well with children and adults with special needs. Bible game time should be a part of every special needs Bible lesson. It is truly a great way to share a biblical concept in a fun and engaging way. How can you effectively teach a child or adult with special needs so that they truly grasp a Bible story and its meaning? This is an interesting question and one whose answer is a double-edged sword. On one hand, do YOU understand every Bible story or concept you are presented? On your own, my guess is “no.” The Bible says that it’s the Holy Spirit that gives each of us the understanding we need. Therefore, whether a mind is of typical cognizance or the mind is affected by a disability, the Holy Spirit is still in charge. Nothing is impossible for our great big and wonderful God. What you will learn from this workshop is how to creatively share Bible stories in ways you might never have tried before. The Word of God along with some great visuals are keys to Bible storytelling success! 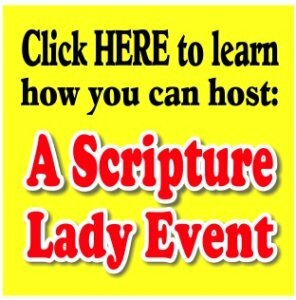 What Does it Take to Book a Scripture Lady Teacher Training Workshop? A room big enough to accommodate your teachers as well as all of her great props and tools. to book your day of encouragement!